July 14, 2004, LG Crabo. 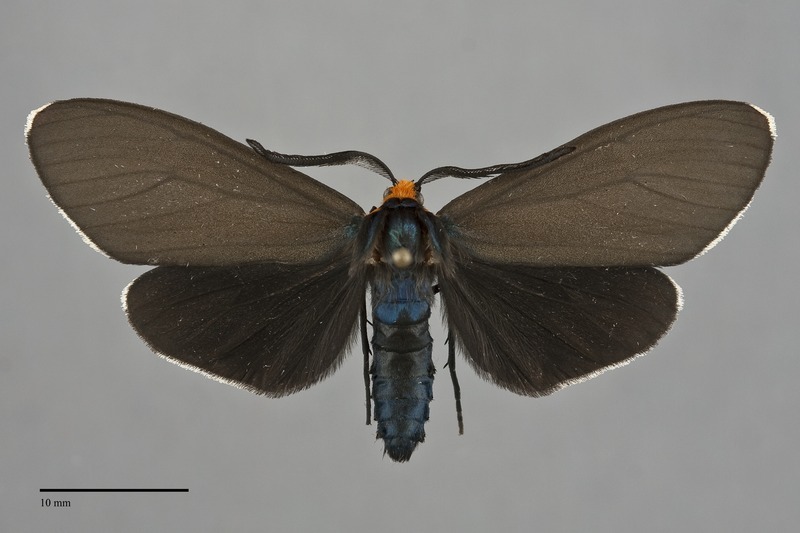 Ctenucha virginica is a day-flying predominantly eastern species which range extends to northeastern British Columbia. It is medium size (FW length 22 - 23 mm) with a striking orange head, black and metallic blue thorax, and metallic blue abdomen. The forewings are dark brownish gray with a slight sheen and white fringe. The hindwing is dull jet black with a mostly white fringe. The bipectinate antennae are black. Cisseps fulvicollis is a similar day-flying tiger moth. It is smaller than C. virginica and has narrower wings. 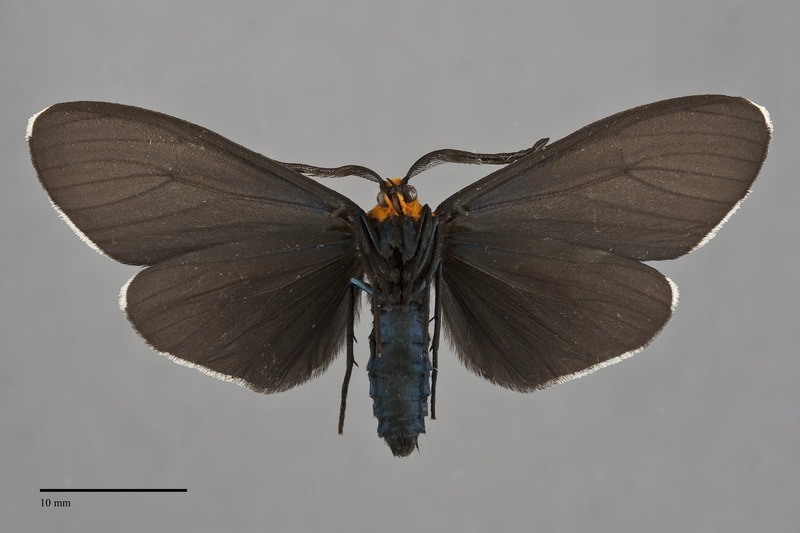 Its collar is orange and the basal hindwing is translucent whitish gray. Ctenucha rubroscapus, found only along the Pacific Coast, has a red head and tegulae. This species has been found in wetland in northeastern British Columbia. It is common in moist meadows and prairies of eastern North America. C. virginica enters British Columbia near Alberta along the Peace River. It has not been found in the area targeted for the Pacific Northwest Moth Project. This species has a wide distribution in eastern North America from Labrador to Pennsylvania and Kansas. Its range extends further west to eastern British Columbia across the Canadian Prairie Provinces. This species is a foodplant specialist feeding on grasses (Poaceae) and sedges (Cyperaceae). The British Columbia specimens have been found in early July. It is predominantly diurnal but occasional specimens are found at lights. Covell (1984) states that it is double brooded in the east.